"A Tradition of Excellence Since 1973"
I am a full-time resident of Northstar™ and have owned property here since 1978. Northstar™ offers a unique way of life during all four seasons and I love them all. 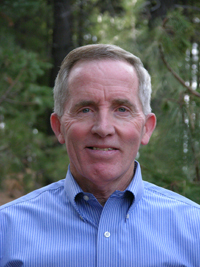 I have been an active licensed Real Estate Broker since 1973 and an active member of the Tahoe- Sierra Board of Realtors since 1988. My education is a B.S. in Accounting from the University of Rochester. After spending four years in the United States Air Force, I left as a Captain and worked for Eastman Kodak for three years. That brought me to California and when it was time to go back to New York, I switched careers to real estate and stayed in California. I was one of the owners of RE/MAX Allied Brokers in Walnut Creek prior to working full-time at Northstar™. My hobbies include skiing, tennis and golf, of course, but I also race a 2006 Corvette Z-06 with SCCA and the American Autocross Series. Please contact me if you are interested in Selling or Buying at Northstar™. My 41 years of experience will insure a smooth and stress-free escrow for you.